Majority of drivers already are familiar with the term DPF ( Diesel Particulate Filter). Most of the time it is associated with costly and not pleasant experience: vehicle went to local mechanic, who offered take it to the dealer or “knock it out and forget about it”. As you know roughly now that this part is “completely not required for your car”, lets see why manufacturers designing such systems and governments implementing more and more low emission requirements for new diesel cars. Furthermore, PM has negative environmental impacts. It comprises nitrates, sulphates and ammonium which are the main drivers for acidification and eutrophication – two extremely damaging processes to natural ecosystems, which can cause habitat loss and affect biodiversity. PM also contains black carbon, a known contributor to global warming. DPFs are essential in reducing current PM emissions in order to prevent these processes occurring. What can be done regarding DPF once it’s flagged as faulty. If your vehicle developed DPF related fault, it needs to be booked to the workshop to be checked and repaired ASAP as continues driving even with limited power will negatively affect diesel particulate filter and more expensive treatment will be required. A special test is required to complete components condition evaluation. Then based on results, mileage and new components costs most effective solution is offered to vehicle owner. like intermittent faulty operation of DPF back pressure measuring sensor due to fault in pipe connections, wiring connector or sensor it self. With faulty sensor if addressed on time, DPF normally does not need any treatment after fault elimination and memory reset. procedure that is normally programmed in engines control module as option to trigger and complete regeneration by vehicle technician. Usually can be applied to cars and vans that failed multiple regeneration attempts due to required parameters not met like not being driven long enough at stable speed at right engine temperature with minimum required amount of fuel in tank. Required conditions for active regeneration do differ from one manufacturer to another but vehicle steady speed, engine temperature and fuel amount in tank generally applies to all. – a special complex procedure most of the time applies to DPF (Diesel Particulate Filter) that has blockage values way above maximum allowed values but not reaching 0.7 BAR of back pressure. – this procedure is called also DPF cleaning but regeneration needs to be achieved afterwards in order no to waste the effort. DPF cleaning is most of the time applied by technician to DPF (Diesel Particulate Filter) that has high blockage values. Back pressure read is usually close to 0.9 Bar. – this procedure is offered to DPF ( Diesel particulate Filter) which has excessive blockage readings with back pressure values exceeding 0.9 Bar. Mileage of the car is usually above 100k miles. Chemical more intense pressure cleaning applied. Replacement option of old DPF is also addressed at this stage as treatment might not be long lasting due to excessive wear of original DPF. – this is usually offered to vehicles with high mileage of 110k-120k miles and regularly driven on motorways yet still developing DPF related faults. The N47 engine family is prone to excessive timing chain wear and premature failure. Rattling noise from the rear of the engine is indicative of the condition. Timing chain failure may call for engine replacement or a costly repair. The issue applies to all applications and power variants of the engine produced from 01.03.2007 to 01.03.2011. The most seriously affected units which require the most extensive repairs were produced from 01.03.2007 to 05.01.2009. UPDATE – It now seems that there are issues appearing with a limited number of engines manufactured after the supposed sale date of 01.03.2011. Engine operating noise check to quickly identify timing chain noise. Complete replacement of timing chains, guides, sprockets and tensioners with upgraded parts. If your vehicle mileage is 80,000 to 100,000 miles – call 02086898088 and ask for advice. Why you should use KMK for timing chain replacement. We only install original engine parts manufactured by BMW – copy parts can fail after 20-30k miles… Original timing chains usually fails at 100-110k miles but cases of failure did happened with mileages just little over 80k miles. What happens when timing chain fails. When timing chain fails, engine camshaft opens cylinder valves at wrong timing, causing piston hitting and breaking valve, valve rocker, damaging hydraulic valve lifters and camshafts. Cylinder head can suffer damage depending on at what speed piston was travelling during the impact (engine RPM). Piston can also get damaged from the impact and cause compression rings to seize. Why it is important to replace worn timing chain and components before it fails completely. 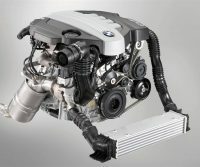 New N47 engine of the shelf cost around £7500,- plus £800,- to install ( POA ). Rebuilding BMW engine with original parts in UK should cost around £6000,- …Copy parts are simply unreliable although this is the only way for engine repairers to keep the cost low and sales high. Also wast majority of so called reconditioned engines are assembled using old pats from salvaged engines. So realistically you are buying poorly repaired engine with inbuilt guaranteed failure. N47 engines have no other design issues and can easily run 200,000 miles if maintained correctly plus it is your original engine with traceable service history and mileage. Call our service team and book you BMW for timing chain test where KMK technicians will measure timing chain elongation level as not all worn timing chains due issue characteristic rattle noise ( those with noise do need replacement in almost 100% of cases). Alternatively you can submit request for a quote by clicking here.